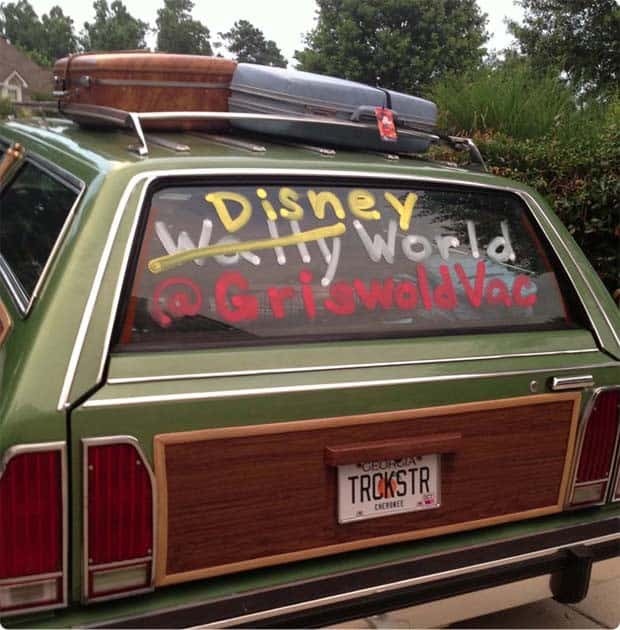 We are the Griswolds, and, yes, we are heading on vacation. I have been hearing jokes all my life but love the National Lampoon Vacation movies. So we decided to create our own Griswold Truckster so we can take the kids on some awesome road trips. If you have seen the National Lampoon Vacation movie, you know the Griswolds purchase the Family Truckster in metallic pea; it’s not what they ordered at Lou Glutz Motors, but after their trade in is crushed into scrap metal they are happy to take home the Wagon Queen Family Truckster to start the family road trip to Walley World. 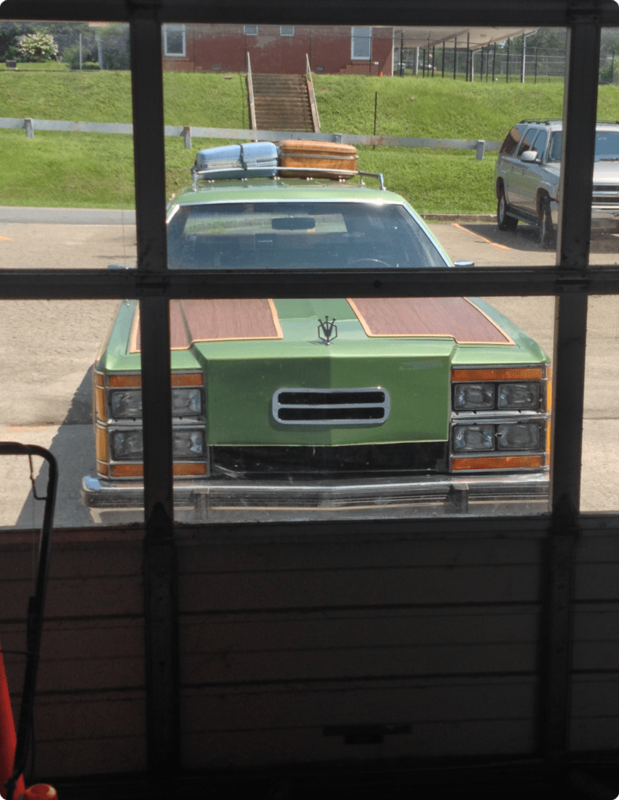 I am sure you want to know how our Truckster came to life. 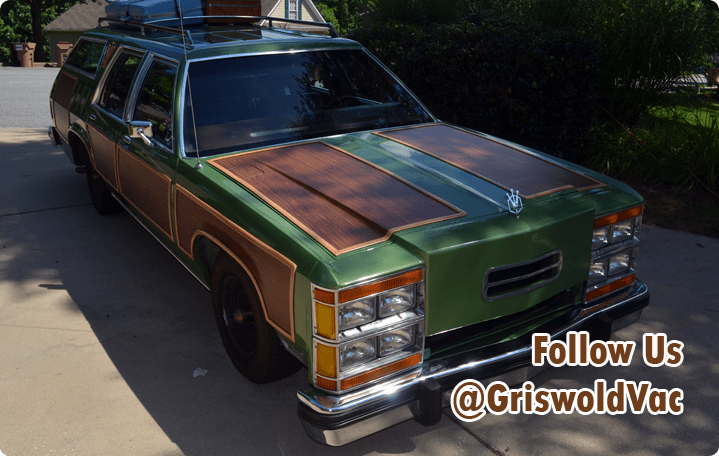 We took many photos along the way and have created a Griswold Family Truckster Photo Album here. Just so you know the Wagon Queen Family Truckster in the National Lampoon movie is a 1979 Ford LTD Country Squire that has been modified by Warner Brothers, not by George Barris who did the Batmobile and other famous movie cars. For some reason George Barris gets credit for the Truckster but Gary Schneider did extensive research before building a Truckster himself and found out George Barris did not build the Griswold Family Truckster. Also the internet will have you believe that the last living Truckster is preserved in a car museum in Chicago. The car in that museum is not one from the National Lampoon movie, it is a replica made by someone for the car museum. 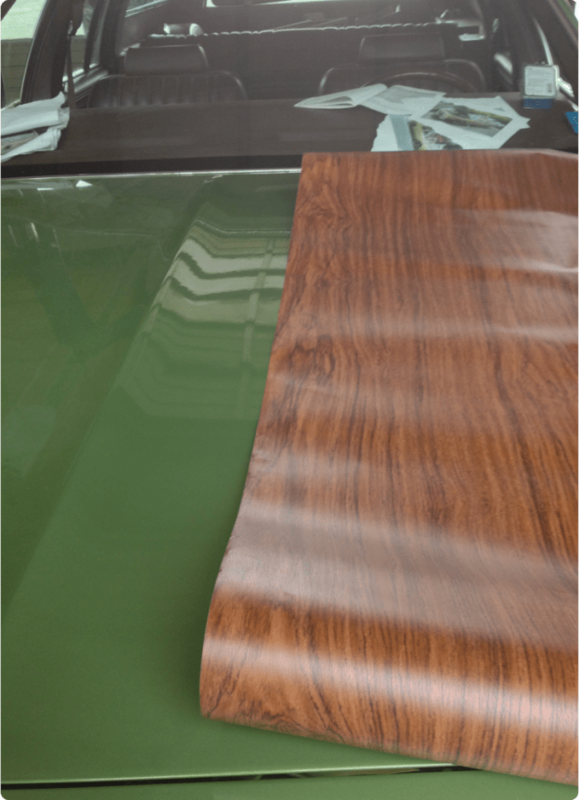 The side mirrors are different; the wood grain and molding are different, and the back side of the car has not been finished. Only the side you see at the museum has the wood grain added. 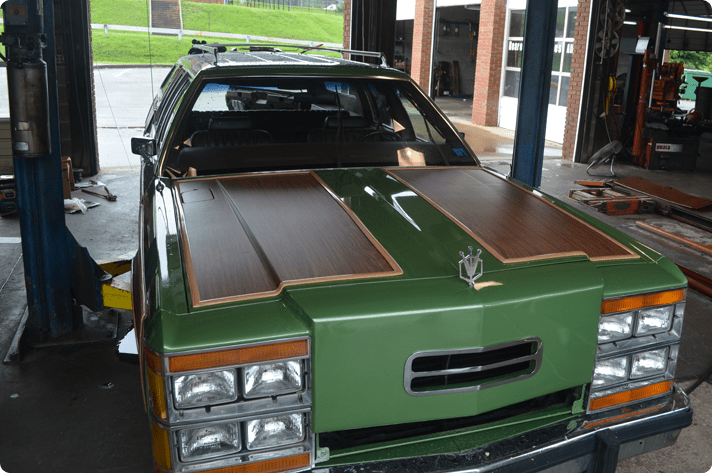 Our Truckster started as a 1984 Ford LTD Wagon Country Squire. It was in pretty good condition for being that old. 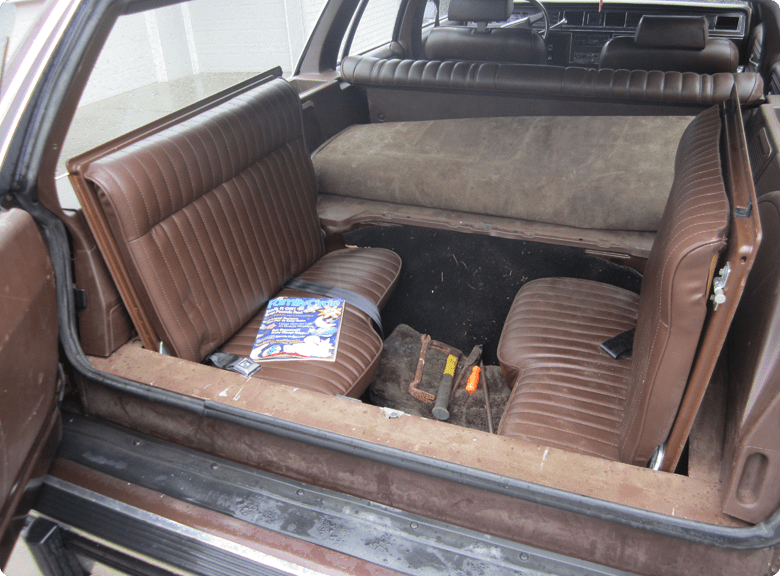 Time to get started and take a perfectly good Ford LTD and smash out the back windows and remove all the trim from the sides. 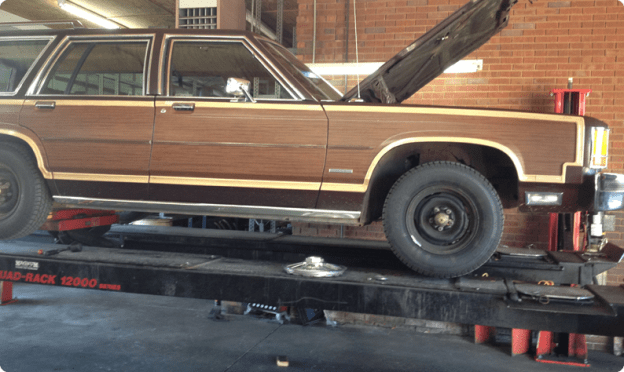 Yeah, George said to buy a Ford LTD without paneling and wood trim but it was difficult to find, so there was a great deal of extra work that our friends, Chris and Brain at B&B Tire, had to do to prep the car. 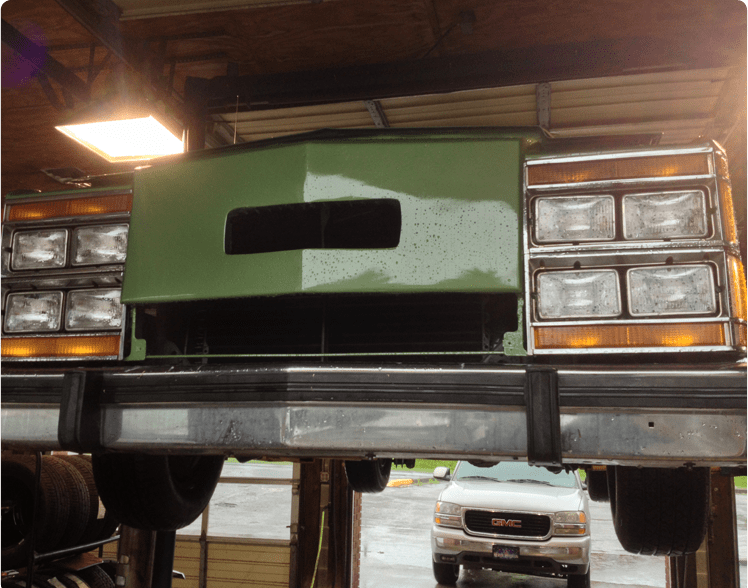 Also the front end had to be removed and remade out of fiberglass. This also made room for the 8 headlights that would be later installed and the bumper that would be lowered. Chris and Brian at B&B Tire in Canton, GA did an amazing job. To the right is Chris cutting out the fancy air intakes for the rear quarter panels. 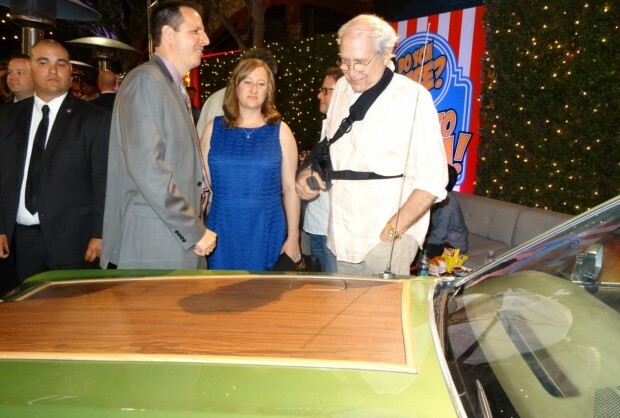 Again, Amber taking the opportunity to get in the photo with the Griswold Truckster. 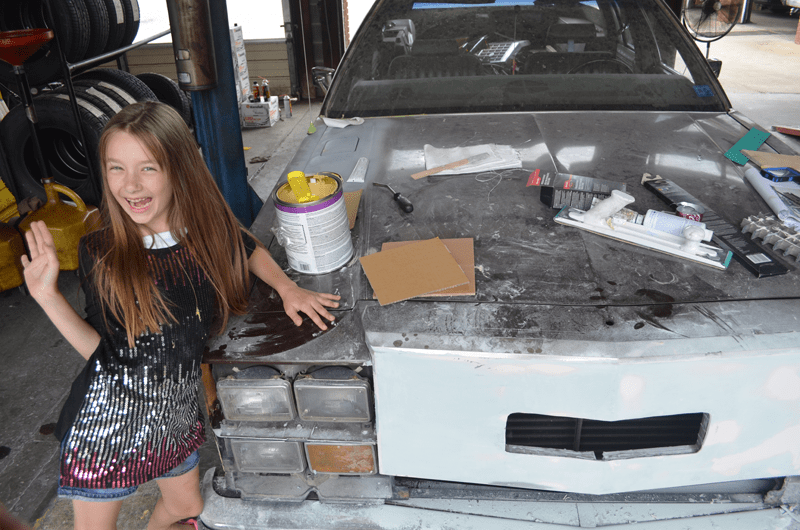 Here, the fiberglass front end is complete on the car. 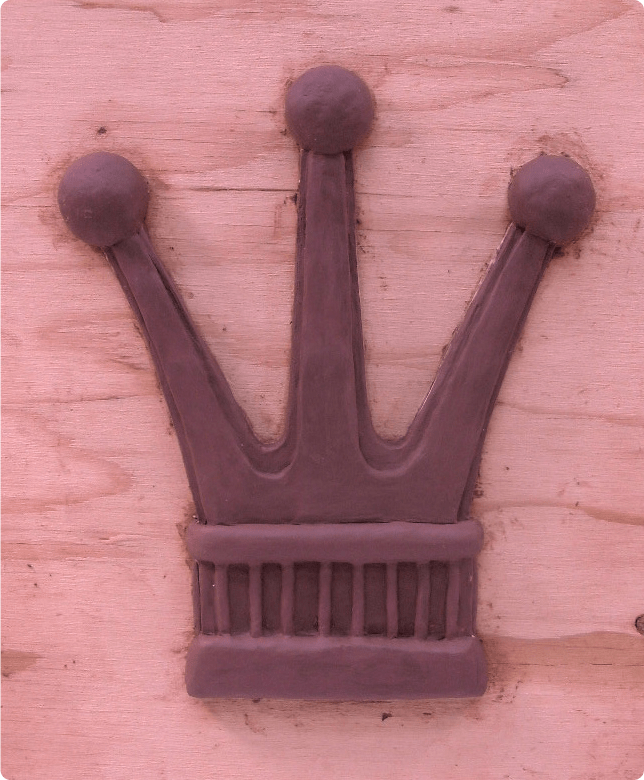 Reije worked in his fine art studio to make this crown for me. It looks amazing. This was the first clay sculpture that was then later cast and then made out of (I believe) a plaster so it could be smoothed down more. 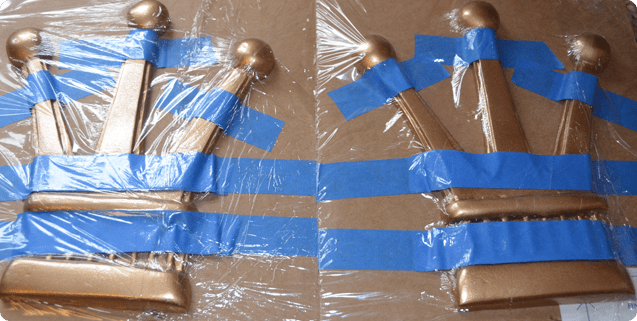 He then made another mold and cast these in a material called Task 8 and then painted them. Here is his work. 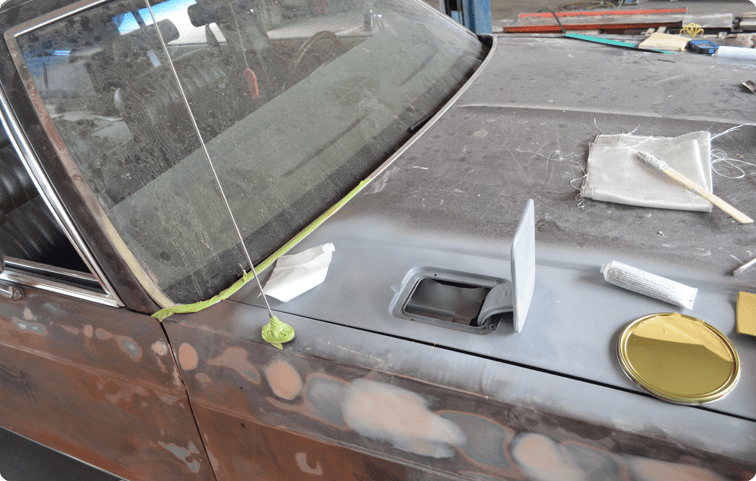 We added the gas to the hood, however I was not keen on filling up a car over a hot engine, so this is a fake gas door. It opens and looks very cool. 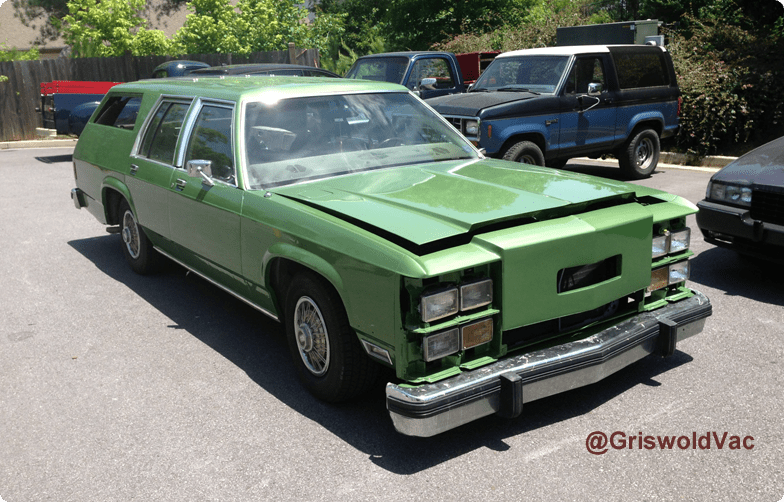 The Ford LTD all primed and then painted in metallic pea green. 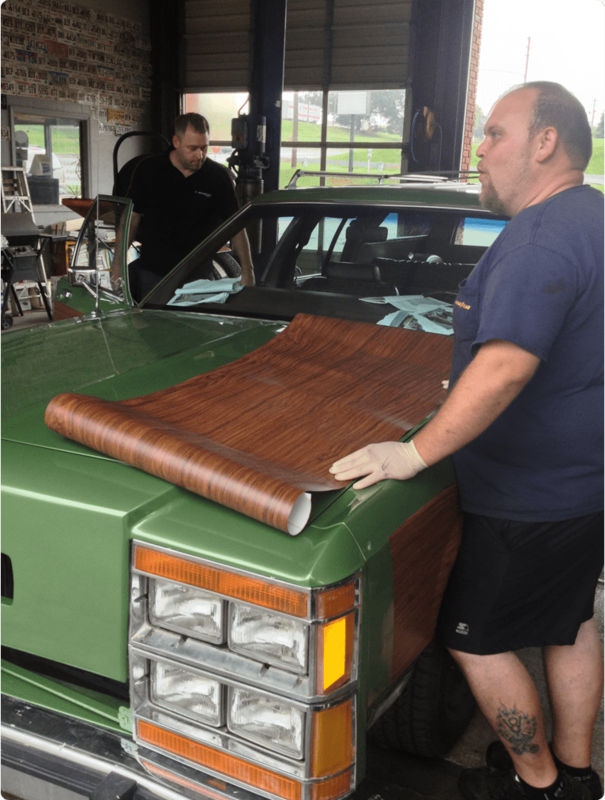 Chris and Brian starting on the wood grain on the truckster. The headlights are also in and looking great. 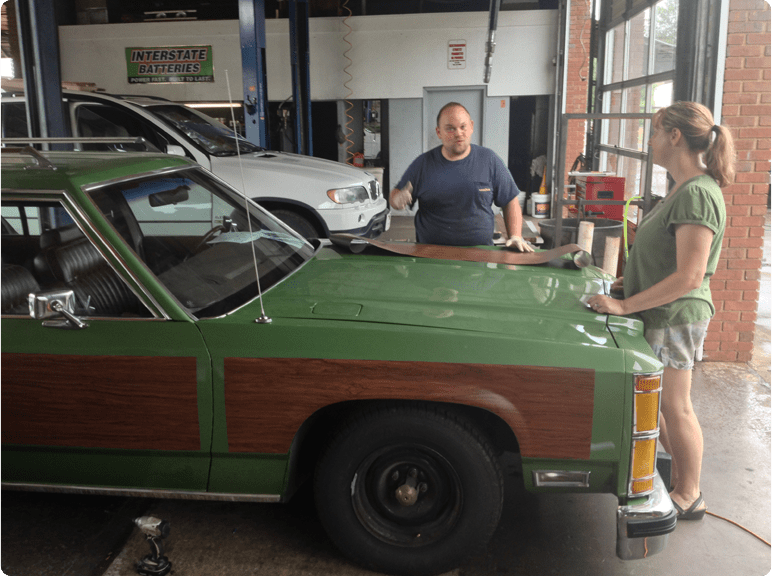 Lisa Griswold and Brian looking over the Truckster. At this point, about six months later, we are really close. 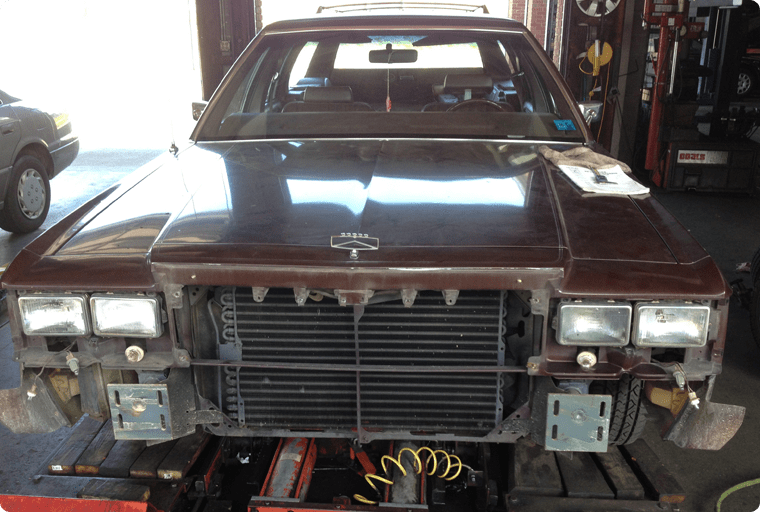 A few final items need to be completed and the overall mechanics need to be checked and several things replaced. I drew this by hand from some photos I saw and then took the measurements to a local shop and had it cut out of 1/8″ steel on a C and C machine. 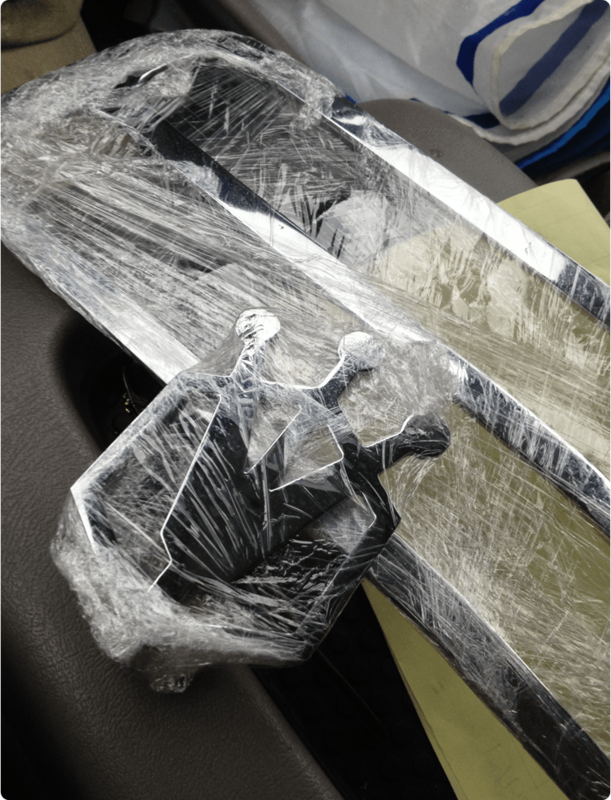 It was then welded at the base, and I took it to Dallas Plating in Dallas, GA to have it chromed. 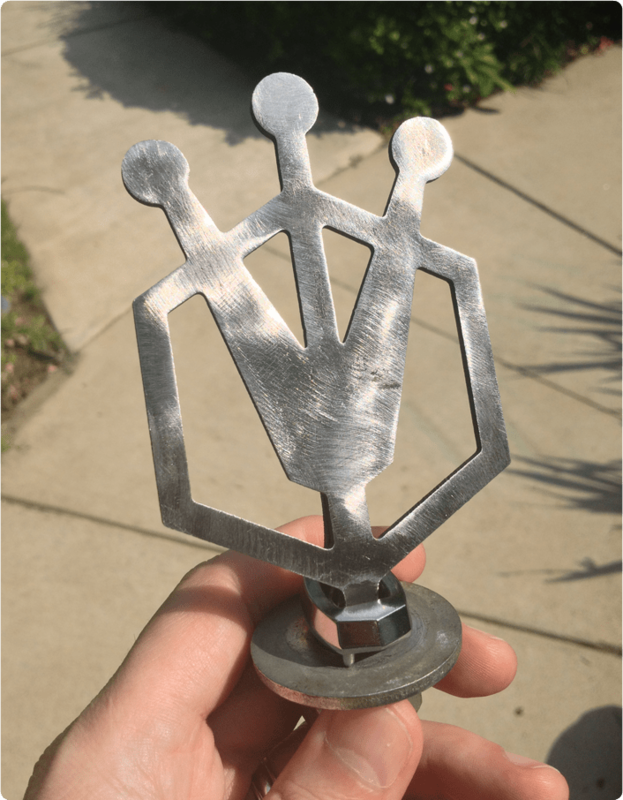 Here is the raw hood ornament before it was chromed. 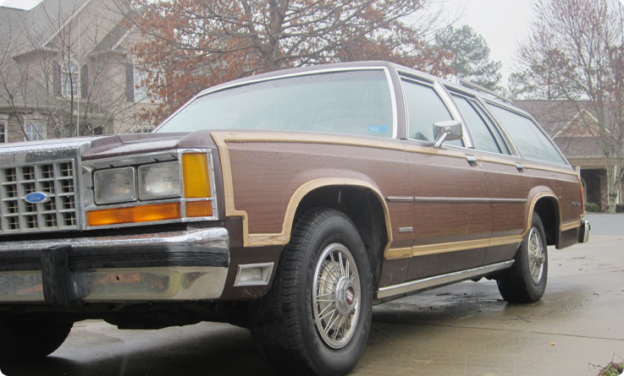 We will be taking the Griswold Family Truckster on many fun family vacations. Please stop and say Hi. If you take a photo please post it and tag it with #Griswold and/or @GriswoldVac so we can see it and add it to our journey. Where can I see you and what’s next? We went to Walt Disney World in Orlando, FL. We are planning another road trip down to Orlando FL soon. Gatorland in Florida, Dollywood in Pigeon Forge TN, and a family road trip across America from Georgia to California is in the works. 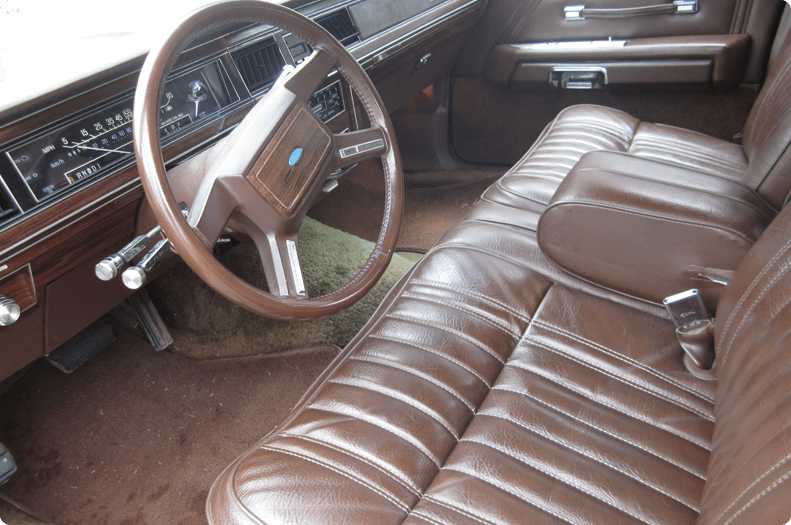 I will also take more photos of the Truckster (interior) etc hopefully in the next few weeks. It came out nice. How much did that cost to make? All in all I would say $15- 17K but a lot of that is custom work and never ending repairs. There is always a $500 – $900 repair bill for something with these old cars. But it’s a lot of fun and we have had some great road trip and priceless family memories. I’ve been looking for someone to build one for me and have had estimates from 20,000 to a high of 65,000. Just so you know, If you are ever in Brunswick Georgia and have any mechanical issues. Please call on me. I will fix it for no labor at all. You get the parts, I got the tools. Thanks Alex. Hopefully we will not break down again soon. Fingers crossed. All I can hear is ‘Holiday Road’! Great job! I love that song. It makes me smile and that’s the reason we built the car. Wagon power! 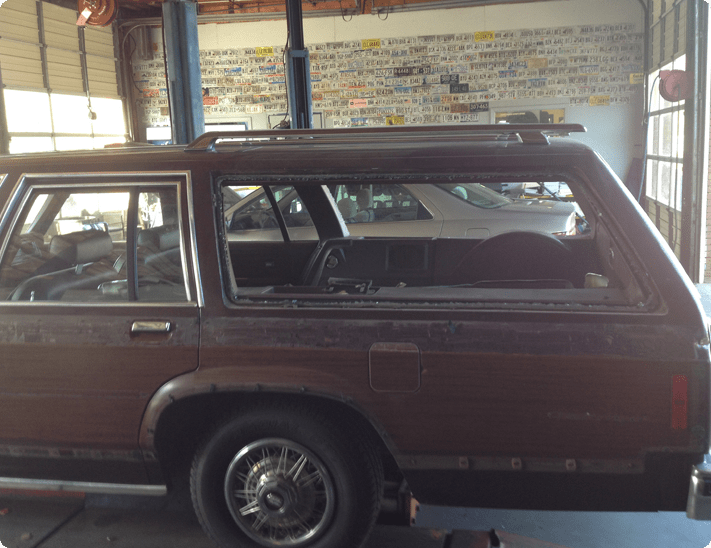 I have a 92 caprice wagon….and people just dont realize the comfort and functionality of old school wagons. Just curiuous… did they use faux wood flooring for exterior panels? That is pretty cool and your name is griswald makes it even better. I love old ford crown Vic’s. Yeah I love the old Crown Vics too. I just don’t have room in my garage for anything else or I could see myself getting into some fun cars. Well and I don’t really have the budget or time either. Steve, have you ever got pulled over while driving the Truckster, and if so, what was the reaction when you handed over a “Griswald” ID?! I think you should rig up a rocking chair & a dummy to look like the granny on top. And/ or attach a frayed dog leash to the rear bumper & drive it down the road, see what kind of response you get. My 19 yr old son just bought an old beater ’85 crown vic wagon. Try’g to help him find ideas in any way possible to make this thing look cool. I saw one on Rt. 49 in Harrisburg / Concord, NC a few weeks ago, but the license plate was different. I was behind it and caught a couple of shots on my phone. It made my day! I see this one all the time in Concord. They actually live near Central Cabarrus High School. Last time I saw it they had a body wrapped in a green blanket. 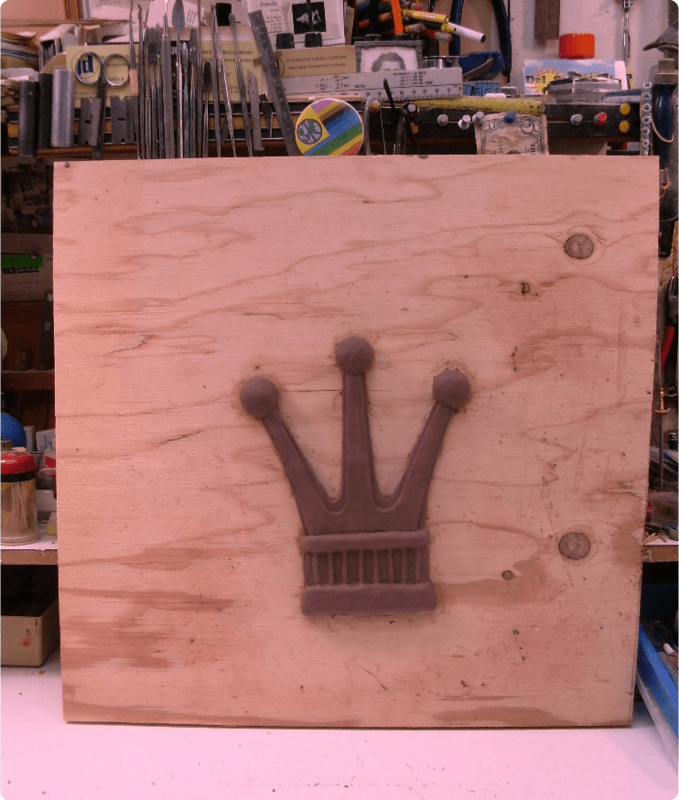 i want to build one of these as well … i have two cars to use but i have a couple questions… could you email me? Up in Alberta, watching the movie, googled the car and found this. I thought it may have been a real production wagon but apparently not!! I saw one today, and I could barely believe my eyes! In was in Texas being hauled on a trailer. I passed it going northbound I-35 about halfway between Denton and the Oklahoma border. That wasn’t y’alls truckster, was it? CLOSET I CAME TO THIS IS I HAVE A 1:18 SCALE MODEL OF THIS CAR BY GREENLIGHT COLLECTIBLES IN MY DIECAST CAR COLLECTION. This is such an awesome project! 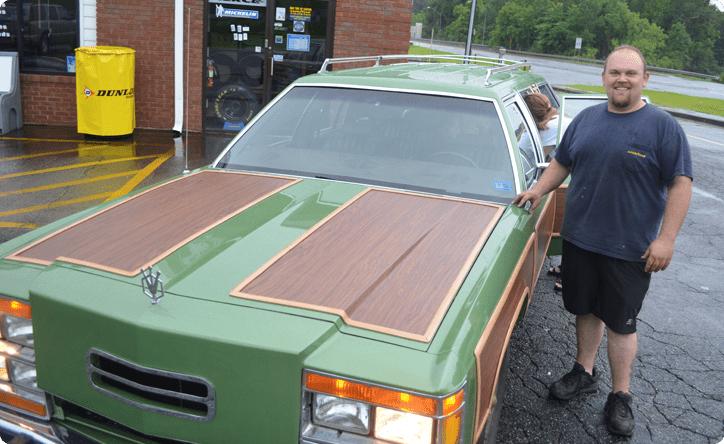 Seriously, your attention to detail in recreating the Griswold Truckster is commendable.. I’m going to link to this from our website I’m sure our viewers would get a kick out of it. Hi Guys……great job!! NLV is one of my all time favourite films, and to bring it into reality is amazing! We are from the UK, but have had many big family holidays to Disneyworld, usually with lots of kids in our 15 seat rental bus……always reminded me of the Griswold’s (but with more kids!!). Back to the US in October ’17, so maybe see you around (although I realize that the US is a big place!). As regards the new film, our son now lives/works in Little Rock (Ark. )……I wonder if he’s been to “Hot Springs” yet…..have you??? Oh I love this! What a great way to raise a family! Great sense of humor. It could only get better if your kids were named Russ and Audrey ha ha! Incidentally, that was seriously my Mom’s and Dad’s names. 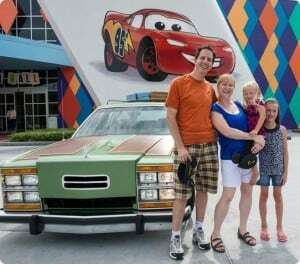 We didn’t have s family Truckster but did have a quirky family! What colour green did you use for the car? It’s a Vacation Green but I forget the code. Are you in Des Moines today (8/11/17) with Aunt Edna on the roof? Nope but sounds like someone was having fun. You Soooo need s body wrapped in a blanket tied to the roof rack! Always wanted buy the truckster and take a family trip. With my kids grown now, I may have passed this opportunity, but congrats for making this happen. I think we spoke. If not send me an email at steve@pixievacations.com and I’ll give you a call. Sorry, I had a few calls over the holidays and might have gotten some mixed up. I show my Mustang around Iowa, and there is a couple who have also made a replica Truckster and take it to some of the shows. It is not professionally done, but it is always a popular highlight when they show up at a show. They have Aunt Edna on top, and have sought out exact duplicates of all the luggage and other stuff on top. Even have an empty dog leash attached to the back bumper. I will get a pic next time I see it and send it to you. If you are ever in Des Moines IA drop by. Thanks Stewart. We need to get back on a road trip, but our schedule has been packed. 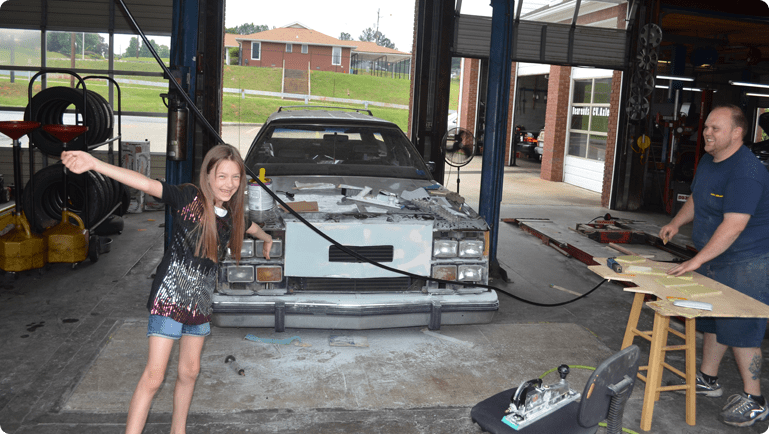 We did Touch A Truck with the Truckster and the kids and adults love to see the car there in Kennesaw GA.
Do you ever enter your Truckster in car shows? You could charge families to take pictures standing with the car and make back your investment …and more. It’s so nice to see how you brought your dream to fruition. Hi Steve, what’s the furthest you’ve jumped this car? Ha ha! I live in Newport Beach, CA and saw a Truckster twice in the past two days. Was that you? Love it! Took a few photos and sent them to some friends who I thought would it. They did & we all agreed that the builder must have a great sense of humor. Good work. Hello. I just purchased a 87 LTD wagon to build a truckster. Would love some help or suggestions on some of the custom parts. Obviously, gasoline vapors so close to an engine–hot or not–would be a very bad idea. YOU DID A EXCELLENCE JOB, CREATING MOVIE HISTORY, THE ONLY QUESTION I HAVE IS WHY IS THERE NOT A GRISWOLD FAMILY TRUCKSTER IN A CAR MUSEUM, THAT IS MOVIE HISTORY THERE, HAVE A SAFE TRIP! Will you be coming to California anytime soon? We did once and again for the Vacation Movie in 2015 the car was there on the Red (Black) carpet for the movie premier. It’s a long haul in an old car. Last time we broke down three times and caught on fire once. Just need to spray paint honky lips on the side now LOL! I know. I just can’t make myself do it. We did Jeff. We took 10 days and drove all the way to Walley World in CA. We actually stayed at the hotel in the Grand Canyon one night too. It was awesome! We have some videos on the site with the Grannd Canyon and other adventures.